I have always been inspired by this quote by Helen Keller, “Alone we can do so little; together we can do so much.” Leadership is not about “me” but about “we.” A key attribute of leadership is promoting a united, collective effort towards a common goal. A leader should be open to new ideas from the team members, acknowledge their input while decision-making and motivating others to take responsibilities. While participating in the Singapore Leaders of tomorrow forum (SLoT) based on the acclaimed Gap Summit organized by the Global Biotech Revolution, University of Cambridge, I realized these factors are essential to be a good leader. This international leadership event focused on discussing the existing gaps in biotechnology. I was selected as one of the Leaders of Tomorrow (LoT), and we worked as a team to develop impactful solutions to address the research and innovation gap in the biotech industry. This enriching experience enabled me to connect with biotech think tanks, research pioneers, clinical and medical professionals and taught me that fostering a cooperative and collaborative approach is the hallmark of a true leader. The field of bioscience has evolved from being an interesting textbook topic to one of intrigue, woven into real life, and always fascinated me beyond anything else. Since my childhood, I developed a natural flair for biology. Learning about our highly coordinated human body kindled my interest, the more I ventured into it, I was spellbound to say the least! My mother has been the most effective scaffold in building my dream of pursuing a career in research. She is the one who instilled the seed of questioning in me, which later rose to the crescendo of research and finally culminated into the person I am today. My career goal has always been to do something beneficial for mankind, which is why I chose to study the interplay of cell signaling pathways implicated in diseases like cancer. I aspire to continue research towards the sustainable development of therapeutics, to motivate future generation of scientists through teaching and most importantly to disseminate my research findings to a global audience. AWIS has provided a holistic platform to network with the professionals in STEM field. Being an active member of AWIS, I got the opportunity to interact with experts in STEM which has helped me immensely to shape my career. As events director of the Central Massachusetts Chapter of AWIS, I am excited to be a part of the dynamic team and propagate the mission of AWIS. AWIS events like networking socials, professional development workshops and symposiums are resourceful and motivate me to stay focused in my pursuit for excellence. I am eternally grateful to AWIS for inspiring me to strive harder each day with equal zeal and enthusiasm for the sustainable progress of bioscience. 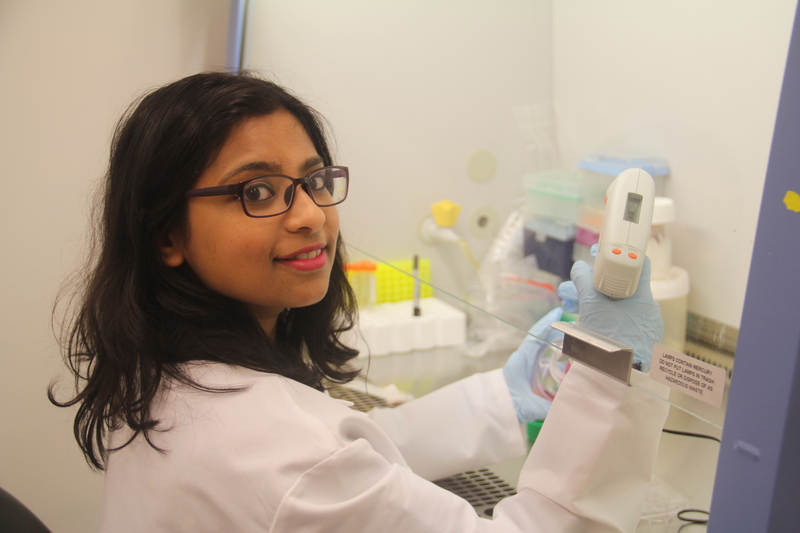 At UMass Medical School, Ishani Dasgupta, PhD, a postdoc in the Dannel McCollum lab, is researching how cells communicate and how signaling pathways play a role in the development of diseases. She is the events director of the Central Massachusetts Chapter of AWIS.